To restore solvency, Congress can either cut Social Security’s pension benefits or increase the payroll taxes that workers pay. A two-year increase in the FRA, to 69, would reduce annual consumption in retirement by 5.6 percent for low-income, 4 percent for middle-income, and 2.2 percent for high-income retirees. The impact of COLA reductions, small at first, would compound over time. For people who live to age 90, the COLA cut would mean sharply lower consumption – 10.5 percent less for low-income, 8 percent less for middle-income, and 4 percent less for high-income retirees. There are a couple ways to increase the revenues going into Social Security: Congress could either raise the payroll tax rate or the dollar ceiling on workers’ earnings that are taxed. The researchers looked at increasing the payroll tax from the current 6.2 percent to 7.75 percent. This would reduce consumption during people’s working lives by 1.55 percentage points per year. Raising the earnings amount subject to the payroll tax – to $270,000 from $127,200 currently – would have a smaller impact, decreasing consumption by 1 percent on the rare American with very high income. The Social Security Trust Fund is currently projected to deplete its surplus in 2034, and policymakers of all stripes know a reckoning is coming. How they respond is the hard part. An idea I have that would reduce SSA expenditures by probably 3%-4%, and no one has spoken of, is to eliminate the “spousal” benefit. Reason 1. The easiest benefit to reduce is one that most people are not expecting, at least until shortly before they can take. I had been in finance most of my working life and I wasn’t aware that even existed until a few years before eligibility, and I thought that I was pretty well-informed! Reason 2. There is no good rational for retaining this unnecessary expense. It was never earned. The spousal benefit is usually picked up by affluent households where one spouse earned well over the earnings cap taxable amount, subject to the SS Tax, and the other spouse had limited-to-no employment history and has paid little-to-nothing into the fund. Do you know all the other benefits that are available? Did you know that someone who is retiring, but has young children, gets a benefit of 50% of their monthly benefit for each child? So the fellow who is 66, with a young wife and young children, gets a benefit for each child (up to the age of 18) and for the wife, who is considered to have a “child in care” until the youngest is 16? This has been the case since the inception of SS. Or that a divorced man (or woman) can have a number of people collecting a spouse benefit on their record, as long as each marriage lasted 10 years? Very many spouses have paid a great deal into the fund, and will never get the full value of it, because, upon widowhood, the lower SS check goes away. What about the people who pay in for 40 years, but die before they collect a dime? I know a few couples like that. Social Security gets to keep all that money. For those interested in these policy considerations, I cannot recommend enough the Report of the Commission on Retirement Security and Personal Savings, out of the Bipartisan Policy Center. It is packed with interesting recommendations, including reform of the spousal benefit. 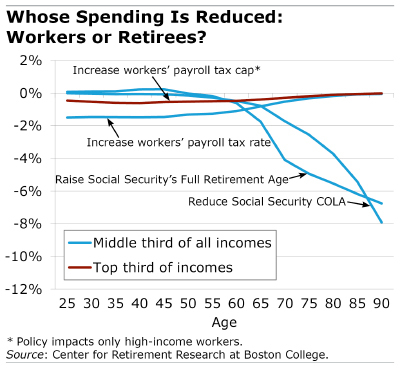 One might analyze Social Security as both: 1) a private paid-for disability, life insurance and retirement program (because these aspects of the program are based on contributions); and 2) a public welfare program (because these benefits are not linearly based on contributions, but rather decrease per dollar as annual average contributions increase). To the extent Social Security is public welfare, all should contribute, not just those with personal services income, but also those with rents, dividends, interest, capital gains, etc. Thus, in addition to employer and employee contributions, the federal government should contribute from the taxes it collects on all incomes, not merely the FICA tax on personal service incomes. While I benefited from the spousal benefit, I could have lived without it. Social Security encouraged me to take it and wait until 70 to increase my own benefit. I was surprised. I’ve said this before, but it bears repeating: the Social Security Trust Fund will not fund anything. This “trust fund” is merely an accounting entry which gives the total amount of SS taxes from prior years which Congress spent for non-SS purposes. Social Security says that this accounting entry is “special purpose” T-bills, and represents real assets. So what are T-bills? Like all bonds – government or private – T-bills are simply IOUs. In this particular case, the special purpose T-bills (or government securities) are simly promises that future taxpayers will fund Social Security. The funding problem that must be solved is not a 2034 problem. Rather, it is a 2010, 2011, 2012, 2013, 2014, 2015, 2016, 2017, and every year after problem. 2010 ws the first year that Social Security became cash flow negative – that is, the forst year that Social Security benefits paid exceeded Social Security taxes collected. So how has the federal government been funding the shortfall since 2010? By increasing the government debt held by the public. So the Social Security program is already increasing the burden on the children and grandchildren of current retirees. The cash flow shortfall for Social Security is currently relatively small compared to overall government spending. But it is growing fast. The funding problem for Social Security is not a 2034 problem. It is a 2017 problem. So far, we’ve been able to solve it by increasing the federal debt. IMO, it is irresponsible for Boomers and for the Greatest Generation to continue adding to the burden of our children, grandchildren, and great-grandchildren. We need to cut the growth of Social Security (and Medicare) benefits now. Pardon my small error: the special purpose government securities “held” in the Trust Fund are technically bonds and not T bills. If we were to get back to the original intent of SS — to provide for the worker’s retirement — then we could repair SS in the blink of an eye. Spouses and minor dependents should be provided for via life insurance, not SS. Disabled workers should be covered by private disability insurance, not SS. Besides eliminating a tremendous amount of fraud, this approach would also greatly lengthen the solvency of SS. Personally, I think it is time for a gradual transition from a government-run program to one that relies more on individual accounts. Employees and employers would contribute to these accounts much like they do now with FICA. The main thing is individuals need to take control of their retirement funds and the federal government needs to keep their hands out of the till. Also the return on Social Security is extremely poor. It is also an inter-generational transfer of wealth which is obviously dependent on demographic structure of the nation, specifically the ratio of young workers to retirees. Personal accounts break this dependency. Obviously this is not a short-term solution, but in the long-term, it should prevent the situation we are faced with today. I suspect many of us in households where one person has a pension and the other a 401(k), allowing outcomes to be compared, have developed a different attitude toward individual accounts. Of course, that’s from the perspective of the retiree, not the account manager. My retiree household has both 401(k)s and pensions. Our 401(k)s over the past 32 years have performed better. I worked in the airline industry — both freight and passenger parts of it — for most of my career. I have observed companies fail and pension plans taken over by PBGC. I think many high income employees would have been better off relying on diversified portfolios inside 401(k)s.
I’d just like to remind you that “workers” and “retirees” aren’t two groups of people. The retirees were workers. Those over 60 voted three times for a Republican Party that promised to cut their income taxes while they were working. With the third cut designed to automatically increase income taxes on those younger in eight years. And yet they want the poorer generations to follow them to bear all the sacrifices required by their insistence of getting everything they weren’t willing to pay for. If payroll taxes are to be increased, shouldn’t the generations that pay a higher tax rate get more benefits. Shouldn’t the generations that kept voting for “less government” actually receive it? I do not believe that most of my generation – the Boomers – wants to see tax rates raised on generations which follow. I think most Boomers who are Republicans want to see government at all levels shrink. FYI, almost every time that tax rates have been reduced in my lifetime, federal tax revenues have increased. The reason we are stuck with trillions of dollars in debt is because Congress and the Presidents – of both parties – have continued to increase spending faster than tax revenues have increased.